Wearable computers or devices have been hailed as the next generation of mobile electronic gadgets, from smart watches to smart glasses to smart pacemakers. For electronics to be worn by a user, they must be light, flexible, and equipped with a power source, which could be a portable, long-lasting battery or no battery at all but a generator. How to supply power in a stable and reliable manner is one of the most critical issues to commercialize wearable devices. 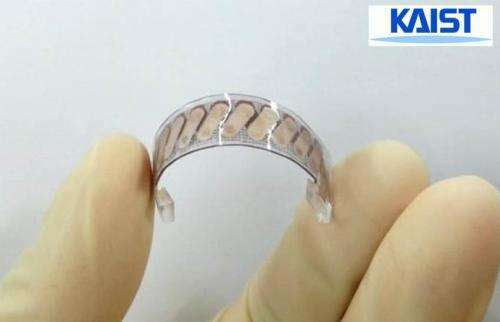 A team of KAIST researchers headed by Byung Jin Cho, a professor of electrical engineering, proposed a solution to this problem by developing a glass fabric-based thermoelectric (TE) generator that is extremely light and flexible and produces electricity from the heat of the human body. In fact, it is so flexible that the allowable bending radius of the generator is as low as 20 mm. There are no changes in performance even if the generator bends upward and downward for up to 120 cycles. To date, two types of TE generators have been developed based either on organic or inorganic materials. The organic-based TE generators use polymers that are highly flexible and compatible with human skin, ideal for wearable electronics. The polymers, however, have a low power output. Inorganic-based TE generators produce a high electrical energy, but they are heavy, rigid, and bulky. Professor Cho came up with a new concept and design technique to build a flexible TE generator that minimizes thermal energy loss but maximizes power output. His team synthesized liquid-like pastes of n-type (Bi2Te3) and p-type (Sb2Te3) TE materials and printed them onto a glass fabric by applying a screen printing technique. The pastes permeated through the meshes of the fabric and formed films of TE materials in a range of thickness of several hundreds of microns. As a result, hundreds of TE material dots (in combination of n and p types) were printed and well arranged on a specific area of the glass fabric. Professor Cho explained that his TE generator has a self-sustaining structure, eliminating thick external substrates (usually made of ceramic or alumina) that hold inorganic TE materials. These substrates have taken away a great portion of thermal energy, a serious setback which causes low output power. "For our case, the glass fabric itself serves as the upper and lower substrates of a TE generator, keeping the inorganic TE materials in between. This is quite a revolutionary approach to design a generator. 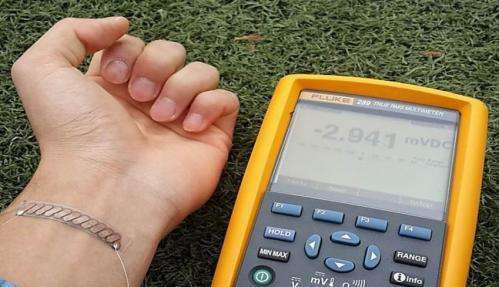 In so doing, we were able to significantly reduce the weight of our generator (~0.13g/cm2), which is an essential element for wearable electronics." 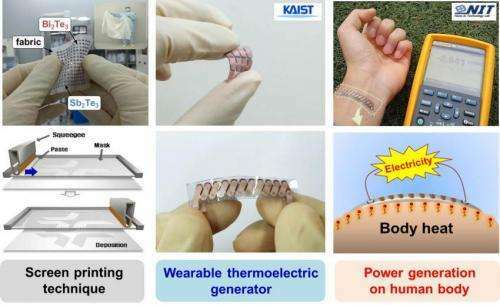 When using KAIST's TE generator (with a size of 10 cm x 10 cm) for a wearable wristband device, it will produce around 40 mW electric power based on the temperature difference of 31 °F between human skin and the surrounding air. "Our technology presents an easy and simple way of fabricating an extremely flexible, light, and high-performance TE generator. We expect that this technology will find further applications in scale-up systems such as automobiles, factories, aircrafts, and vessels where we see abundant thermal energy being wasted." This research result was published online in the March 14th issue of Energy & Environmental Science and was entitled "Wearable Thermoelectric Generator Fabricated on Glass Fabric."